"This tangy sauce adds a sweet kick to everything from grilled fruit skewers to chops, chicken, meatballs, and sausage. Use liberally for grilling or baking meats, fruits, or vegetables. Store in a jar in the refrigerator for up to 2 months. " 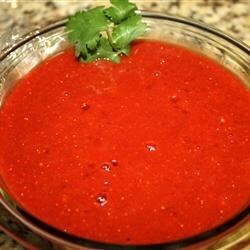 Place the strawberries, strawberry jam, ketchup, green onion, honey, soy sauce, lemon juice, hot sauce, crushed red pepper, liquid smoke, and salt in a blender or food processor; blend until smooth. See how to make a simple strawberry sauce for cheesecakes. Sorry. Wasn't a fan. I didn't like the strawberry tomato texture and flavor.